We are pleased to announce the addition of a Companion Therapy Laser to our practice. 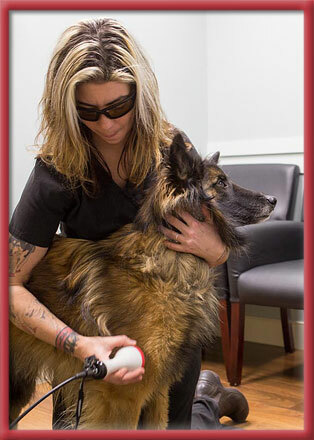 The Companion Laser at Stoney Brook Veterinary Hospital is a Class IV high power machine that delivers a high dose of light energy to deep tissues and joints painlessly and efficiently. The laser light is delivered through a noninvasive hand piece. This is done in an exam room with you (if you choose) and your pet. The experience is pleasant and comforting. Improvement is sometimes seen after the first treatment; however, most pets require several treatments to achieve maximum benefits. Generally, 4 - 8 treatments produce the best results. The length and frequency of treatments varies with your pet’s condition. We will recommend a laser treatment plan specific to your pet's condition.